Walmart's manufacturing plant located in the Stemmons Corridor looks a bit like a 1950s-era school building, but a look inside the facility reveals 320 full-time associates and a variety of robotic machines producing tens of thousands of custom-crafted eyeglasses each week. Manufacturing is alive and well in the United States. Meet Exhibit “A”: the Walmart Optical eyeglass manufacturing facility located in the Stemmons Corridor, which quietly produces tens of thousands of custom-crafted eyeglasses each week. Recently, Walmart invited Dallas Innovates to put on a white lab coat, clean room shoe covers, a hardhat, and protective eyewear to tour its 40,000-square-foot optical plant on Directors Row in Dallas for an inside look at the thought, work, and methodology behind the facility. The building’s exterior is more reminiscent of a single-story 1950s-era school building than a factory. The facility, which opened in 1996, employs 320 full-time associates, who work in concert with a variety of robotic machines and automated devices to fulfill Walmart and Sam’s Club customers’ eyewear orders, from the lens up. Walmart manufactures eyeglasses domestically, in Dallas and its other U.S. factories in Fayetteville, Ark. and Crawfordsville, Ind. to assure rapid turnaround for domestic customer orders. Since 2015, those three facilities have undergone substantial renovations and upgrades to improve production efficiencies, such as the installation of an overhead conveyor belt. Before those renovations/improvements, the glasses were largely produced manually, according to Dyer. Aside from producing eyeglasses for consumers, Walmart manufactured 1,623 pairs of glasses within a recent 12-month period for See to Succeed, which is part of the nonprofit Houston Health Foundation. See to Succeed—piloted in 2011—has made 47,000 student referrals to vision clinics in the Houston area. The Dallas facility of Walmart Optical also raised $12,000 in employee donations to benefit the Children’s Miracle Network in 2017. All photos taken by Rebeca Posadas-Nava. First, the lenses are picked. Then, the lenses get a protective layer attached to one side with savor tape, using machines. Another machine attaches a block to the lenses, which must undergo a 30 minute cooling process. The lenses cool on the conveyor that spirals around the factory. After cooling, the lenses are polished. Lenses are then cleaned so that they can go through the anti-reflective coating process. Because lenses absorb water like a sponge, they have to be dried in ovens before coating. The washed and dried lenses are mounted so they can be coated. After being coated, the lenses have a reflective green color that only appears after AR coating. The lenses are mounted and inspected before shipping inside the facility. In this week's rundown on ideas and innovation in North Texas, we caught up with local leaders to recap their experience at this year's SXSW. HBO is partnering with AT&T and AR startup Magic Leap to celebrate the TV show's final season—and let fans attempt to take on a White Walker—through immersive technology. Lyft had a busy week—first launching their scooters in Dallas, then a debuting a much-anticipated IPO on Wall Street that raised $2.34 billion Friday. Amazing things are invented, created, and produced right here in North Texas, every day. 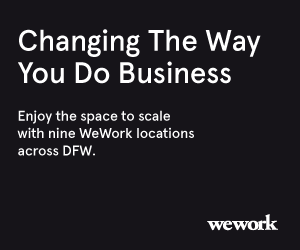 Dallas Startup Week is ready to show off that "wow" factor. Rent My Wardrobe, an app that allows you to wear stylish clothes from local closets, celebrated its launch with a party at Circo that featured A-list guests—and a taping of the Real Housewives. Also, it is near securing $1 million in seed funding with a $4 million cap from a network of angel investors and family offices.